Dr. Alkuwari is an Arab board certified orthopaedic surgeon who specialises in the treatment of complex spinal disorders,including spinal trauma, spinal tumours (extradural pathology), adult and paediatric deformities, scoliosis, and severe degenerative diseases. His training involved orthopaedic surgery followed by formal spine training in paediatric and adult spine services, and he is accomplished in minimally invasive spinal surgery as well as open complex spine surgery. Dr. Alkuwari completed medical school at the Royal College of Surgeons in Ireland, before doing an orthopaedic residency at Hamad Medical Corporation. This was followed by a two year Complex Spine Fellowship at University of Western Ontario, Canada, where he also completed a Masters in Spine Biomechanics. Dr. Alkuwari started practicing at Aspetar in 2014, when he was appointed Assistant Programme Director of Orthopaedic Surgery. He also has an interest in teaching and research. Dr. Alkuwari chaired the 3rd Qatar International Spine Conference., and has taken part in many local and international spine conferences. He is also a member of AOSpine. 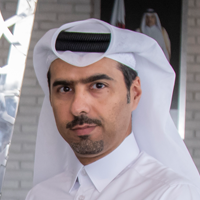 In addition to helping patients, Dr. Alkuwari is an avid cyclist and is Co-founder and Director of Qatar Cyclists Centre. He is a health activist who believes that sport is a way of life, and he has contributed to many health initiatives as a result. He is also a certified scuba and free diver.